I moved to Los Angeles when I was almost 30, chasing love. The love, fortunately, worked out; but for a long time Los Angeles didn’t. I was lonely, bound in by concrete and car exhaust, unable to wrap my head around the city’s optimistic sprawl, unsure where and how I would ever find any friends. They certainly didn’t seem likely to emerge from the population that I surveyed every day at my neighborhood Coffee Bean & Tea Leaf: girls in Juicy Couture velour, headshots peering out of handbags, as nervous as wild colts as they assessed the competition over their nonfat Ice Blendeds. So when an old friend hooked me up with a woman I’ll call Jessica, a whip-smart, idiosyncratic artist who had also recently moved to town, I was elated. The two of us — along with another recent-transplant friend, let’s call her Claire — soon became inseparable. My first years in LA were defined by our friendship: art openings, dim sum, hikes in Griffith Park, spontaneous dance parties in our backyard, long conversations over chilled rosé. I watched her career explode; she supported me through the publication of my first novel and the birth of my first child. And then, after six intense years of friendship, Jessica ghosted. First she stopped returning Claire’s calls and emails — “She wasn’t elevating me,” Jessica told me when I tried to play intermediary — and then, not long after, it was my turn. She just … vanished: My phone went silent; texts disappeared into the ether; an invitation to a dinner party got a strange, terse response: “Can’t make it, have a blast.” And then that was it. As if our entire history together had been erased, overnight. 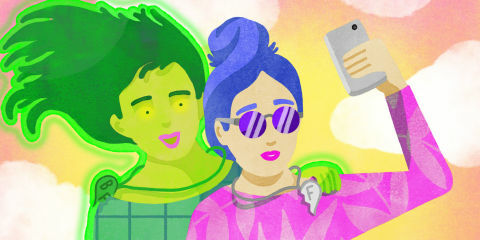 It’s shocking when a friendship dies that way: It feels impossible that you can experience total platonic love and devotion for another woman — BFFL all but tattooed on your heart — and then, abruptly, realize that you didn’t know that person at all. That your friendship was not what you thought it was; that it was just a way-stop for the other person on their path to bigger, better things. Those of us left behind in Jessica’s wake turned to each other, hurt and confused: Was it something we had done? Were wethe failures here? Aren’t your closest friends supposed to be the one thing in life you can rely on? This particular self-doubt was, unfortunately, familiar to me: This wasn’t the first time a close friend had dumped me. While I have had lovely, lifelong friendships with women, my history has also been peppered by a series of intense friendships that felt more like romantic relationships, both in their duration (years) and in their termination (abrupt, confusing, and ultimately devastating). In my experience, friendship is often something that burns hot and strong before dying without warning, like a lover jilting you at the altar. Women don’t talk as much about those kinds of toxic, temporary friendships. Instead, we like to romanticize the forever-friendship, idealize enduring sisterhood as the norm — Thelma and Louise driving off the cliff together, to hell with men, just them against the world. We idealize this notion because that’s what we want to believe. But the truth is that many friendships have something festering under the surface — some resentment, some inequality, or just the inevitable annoyance that comes with spending insane amounts of time with another human being. Healthy friendships overlook these flaws or address them straight-on, but both parties have to be onboard. Looking back at my years with Jessica, I can see how unhealthy our relationship was, how I overlooked the unsettling signs of imbalance in the name offriendship. I see now that I wasn’t allowed to challenge her; she was a classic narcissist who needed me to be in thrall. And there were things in her history that should have rung alarm bells early on: the string of old friends she didn’t talk to anymore, all of whom had been guilty of mysterious personal betrayals; a certain knack for reinvention that she had clearly mastered along the way. The way she seemed so keenly interested in people with power and money, of which I had neither, and also so condemning of our friends’ weaknesses. So while I was in it, for keeps, she had probably always had her eye out for the next big thing. IT FEELS IMPOSSIBLE THAT YOU CAN EXPERIENCE TOTAL PLATONIC LOVE AND DEVOTION FOR ANOTHER WOMAN AND THEN, ABRUPTLY, REALIZE THAT YOU DIDN’T KNOW THAT PERSON AT ALL. Maybe I should have seen it coming. 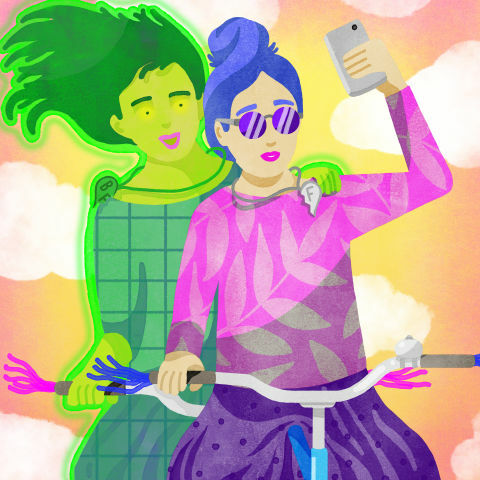 After all, Jessica wasn’t the first best friend who had ghosted me — in my late 20s, I’d had a nearly identical experience. “Danielle” was in my small circle of girlfriends in San Francisco. We were glued at the hip for several years: we traveled together to Mexico and rented a ski house together every winter; I watched her cat when she was out of town. When I went through a drawn-out, painful breakup with my long-term boyfriend, her shoulder was the one I cried on. Which is why it was so confusing when, out of the blue, she one day announced that she no longer wanted to be my friend. “I find you annoying,” she told me, an explanation that sent me spinning downward into a pit of self-recrimination. She’d found the most tender place within me, located my worst fear, and pressed it. Within weeks, however, Danielle’s real motivation for dumping me became clear: she had started dating my ex-boyfriend. She wanted him, ultimately, more than she wanted my friendship, which I could (barely) understand. And yet the wound that she opened all those years ago remains there even today, a whisper that always sits at the back of my mind: You are annoying. No one likes you. Not even your closest friends. When Jessica dumped me a decade later, I secretly believed that it once again all boiled down to my unlikability — even as it grew clear that this was Jessica’s behavior pattern and not specifically about me. Ironically, I spent so many years obsessing over what had happened, rehashing Jessica’s behavior, analyzing her personality, that I eventually realized I had a fully formed character for my next book — the intoxicating narcissist who became the center of my new novel, Watch Me Disappear. After all, I’d become something of an expert on compelling women who disappear and the damage they leave behind. And yet, despite all this retrospective clarity, the pain of these lost friends still lingers. That is the greatest danger of this kind of intense, toxic friendship: the damage they inflict feels so damn personal. Losing a friend feels like a failure, a more inexplicable failure in many ways than losing a lover. Womenaren’t supposed to “fall out of love” with each other so abruptly. They aren’t supposed to dump each other so cruelly and inexplicably. So when they do, it’s hard not to wonder whether it is somehow all your fault. All these years on, though, I can’t say I regret either of these friendships, no matter how painful and confusing the breakups were. I approach friendship now with a grain of understanding that this may all be temporary and that a forever friendship can’t be assumed, no matter how close I may feel to my girlfriends. I am warier now, which is sad, but I’m also more prepared for loss if it comes. I do still have close relationships with girlfriends, though, including some that have lasted decades and promise to last many more. These women are the anchors that keep me sane while juggling motherhood and marriage and career and the general anxiety of life. But the boundaries between their lives and mine feel clearer now than they once did: Maybe it’s a function of growing older and having a more full life, but I don’t feel the need to get lost in a friendship anymore. It’s been hard enough to find myself.